Unhear it , a free online music streaming service that getting annoying songs out your mind by getting new and catchy songs. Unhear it using the latest in the reverse-auditory-melodic-unstickification technology to bring you the fresh and catch tune. 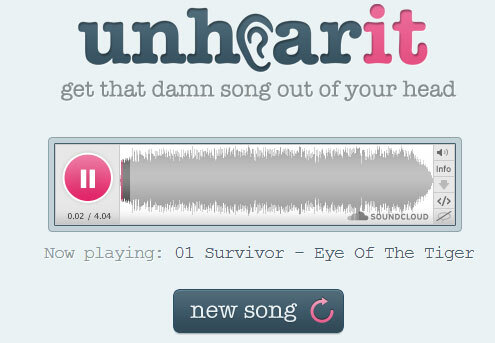 Just visit the Unhear it, Click the New song button and Unhear it will bring you the catchy tune to kick out the damn song out of your head. I was playing with this service for the last few hours By clicking the new button. And it’s been really amazing experience, that the every click brings you the catch tune. I’m sure that every new song will make you forget the previous tune. After the hours of test We conclude that it’s really brings you the excellent music. The player has no controls to choose songs except the new song button. One of the biggest cons of this service that Every time you have to press the new song button to play the next song. Other than this you can share the song with social networks and it allows you to download the songs from its service. Final Fantasy V For iPhone & iPad Released, Download Now!